Anything Portland can do, we can do better, obviously, so we're matching their local booze battle royale with one of our own: we rounded up eight locally made liquors (no, not the obvious ones like Oola, or Sun Liquor... or even the funny ones like Sparkle Donkey) and, with some help from Mike McNett of Local 360, decided to see if we could pick the best vodka, gin, whiskey, and moonshine made anywhere in the Northwest! right here in Seattle. Initial Impression: "What? This only cost $10 a bottle?" Flavor Notes: It’s the tiniest bit sweet, which you'd expect from spirits made from seasonal ingredients (sour cherry, pumpkin, etc.) that are about to be thrown away by Skagit Valley farmers. Deep thoughts: Still can’t believe this stuff is only 15 bucks after tax, I need like 5 bottles now. Flavor Notes: Slightly pine-y, almost like a gin… and a little harsh. Deep thoughts: I'll hate it in the morning, but I love it right now! 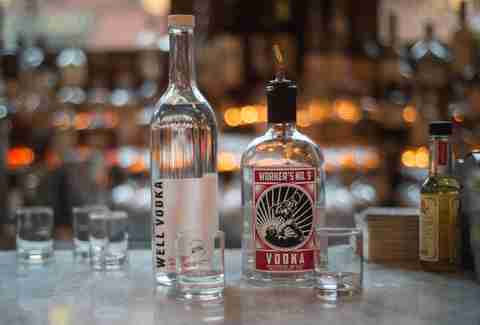 Final Verdict: The Well Vodka definitely wins for its subtle flavors and 'cause you'll feel relatively... waitforit!... well the morning after you drink it. Initial Impression: "It smells so good… you never need to own cologne again!" Flavor Notes: All the usual suspects are present -- juniper, citrus, pine, etc… but are seemingly amplified in flavor compared to a lot of gins. 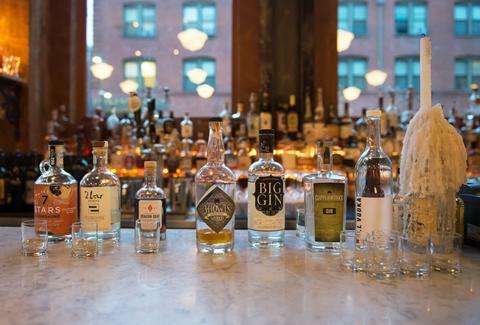 Deep thoughts: "Big gin is exactly what it sounds like -- a gin with a really big flavor”. Initial Impression: "This smells a little like vanilla and has an almost sipping quality". Flavor Notes: "Soft and mellow—definitely gentler than the Big Gin". Deep thoughts: "It's completely different than the last one... like comparing apples to a steak sandwich". Final Verdict: If you like gin, you’ll definitely like Big Gin. 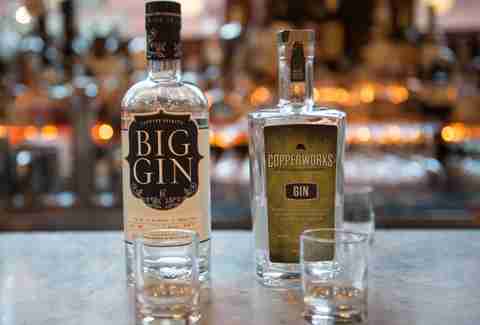 If you’re not so much of a gin drinker, the Copperworks Distillery might be more up your alley/ a good gateway to gin just because of its relative drinkability. 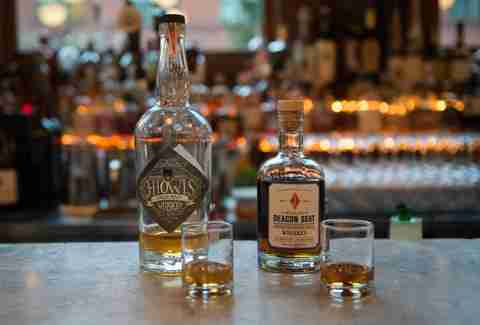 Flavor Notes: "Really complex peaty notes, especially after you put a huge ice cube in it to open things up". Deep thoughts: "This stuff is 1.5 bottles of Well Vodka a shot, but totally worth it”. Initial Impression: "Wow, this is really awesome for such a young whiskey". Flavor Notes: "There’s a stronger peat flavor here than the last one, … in a good way". Deep thoughts: "It’s going to be hard to chose between these two. This one probably belongs in cocktails because its intensity will stand up to the other ingredients in a mixed drink". Final Verdict: This was a really close one, but ultimately the Deacon’s Seat single malt was more multi-dimensional and interesting. Initial Impression: "Uh-oh, the bartender just said ‘Now this is where things take a turn for the worse’...". 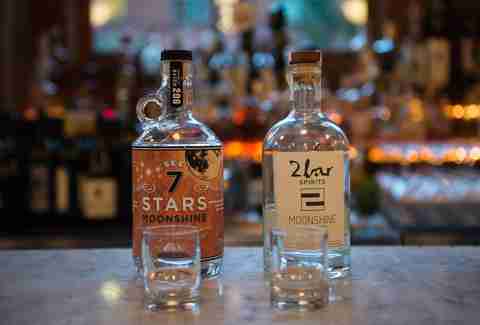 Flavor Notes: We tried out both the plain moonshine and the apple moonshine. While the plain version really didn’t taste like much at all (it was actually kind of like vodka), the apple was… well… apple-y and great smelling. Deep thoughts: "Hmmm... Christmas cocktails here we come!" Initial Impression: "That's got some funk… that I actually maybe kind of like?" Flavor Notes: "This stuff hits you in the face… and I’m kind of afraid to say what it tastes like". Deep thoughts: No deep thoughts here, just a head on the table. Final Verdict: We’re going with the See 7 Stars -- it's easier on the palette, much smoother, and doesn't make you see quite as many stars.